This is a widely debated – highly contentious discussion. Is the Instagram Shadowban real or is it a myth that has gone caught traction and hype? Its one of those things that can be incredibly frustrating and absolutely miserable when it feels as though you are in the “shadowban”. The term “shadowban” has been around since 2006, but it’s only recently (in the last year) gotten a lot more traction and hype. In Feb 2017 Twitter announced that they had started filtering out abusive unnecessary tweets, by enforcing a temporary time out. With Twitter – thy actually informed their users of a breach of the terms of service and that they had been shadowbanned. Soon after Instagram released a similar statement. The term shadow-banning came around about a year ago – when accounts started seeing some a significant decrease in engagement, specifically with those associated with hashtags, and not appearing in the hashtag search results. This obviously then directly impacts the ability for people not following you (non-followers) to find you or your profile and content in searches or explore feeds. This obviously results in lower engagement. Quite often you will find that your existing users can see your your accounts, but potentially not anyone else. By definition, a shadowban is the process of blocking a user profile from an online community (twitter or instagram) in such a way that they don’t realize that they’ve been banned. This could be Instagrams way of admitting this issue without actually coming right out and admitting it. They make it clear that good content is critical and that you need to have a clear brand, distinct visual presence and be a store teller. Interacting in your Instagram community is key too! So was this Instagram ways of forcing you into a position to pay for content being seen? Maybe? How does one get shadowbanned? There are a variety of ways that you might have been shadow banned BUT! It might be that you have been hit with any one of the Instagram algorithm updates. That means, if your engagement isn’t what it used to be, that doesn’t automatically mean you’ve been hit with an Instagram Shadowban, It could be content, seasonaility and a variety of different reasons. So typically Shadowbans are caused when you breach Instagram’s terms of service. One of the key ways that people seem to be shadowbanned is from using hashtags over and over again – But using the same hashtags over and over again doesn’t seem like the kind of drama that should get you shadowbanned right? 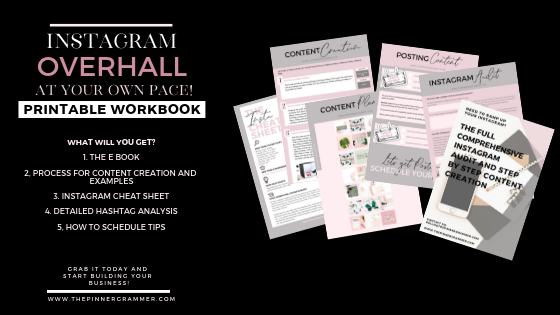 It really just means that you’re engaging with your Instagram community, by finding the best hashtags for your niche and using them consistently in your posts is all part of an effective Instagram marketing strategy! So why are you being punished? The Instagram Shadowban is a reality. It exists to discourage accounts from violating Instagram’s rules and to curb the number of marketers spamming people. It is similar to what Twitter has done by limiting what tweets end up on news feeds. This is all in an effort, I believe, to boost ad spend and punish those who violate their terms of agreement. What this means or users, and small businesses, in particular, is that there is a need to be a lot more strategic in your social media strategy. Posting something and hashtagging the hell out of it, using bots, and posting unsavory content, is not the way to go. Making sure you have done your hashtag research and not using some of the key banned hashtags is key to not being shadow banned. Is the shadowban a myth? In my opinion, it’s way easier to blame some mysterious outside source when content underperforms versus taking a hard look at why it failed. Creators tell themselves oh, it’s just the shadowban, that’s why all my posts don’t get many likes instead of investigating ways to improve that failed content. Nobody likes to admit that their photos or videos need work. The cold reality is the Instagram space is now incredibly competitive. Your content has to be high quality and truly original in order to earn that like or follow. Unfortunately, there are a lot of brands and content creators who are missing the bar on interesting content. When I have a post that flops, I always take it as a chance to understand why. Is it the image? The caption? The wrong time of day when users aren’t online? Blaming the shadowban may help your ego, but in the long run, it’s not going to help your Instagram profile. I don’t think it is real. When people post content at the wrong time, using the wrong hashtags, and have bad to ok content, the Instagram algorithm will stop showing it much earlier than a piece of content posted at the perfect high traffic time, using great specific hashtags, that has amazing content everyone who sees likes. You have to take advantage of the algorithm and post really good content to get engagement on Instagram, otherwise you may be under the delusion you were shadowbanned when in reality your content just isn’t that good, combined with circumstantial factors such as time of post. I think people want to believe there is such thing as a shadow-ban because it explains why their reach/engagement is dropping. They confirm the shadow-ban by searching hashtags using an account different from their posting accounts. But we have to remember that Instagram is different for everyone, it’s based on an algorithm now, so what I see in my hashtags is always going to be different to what the next person sees in their hashtag search. Even if their interests are aligned, everyone still has different scrolling, viewing and liking patterns. So just because a post doesn’t appear in one persons hashtag search, doesn’t mean it isn’t there for another persons. Is it real? Or is it a myth? Well, maybe. Here is why. First, you have to understand how the Instagram algorithm actually works. In 2016, Instagram announced that they will be releasing an algorithm that will sort all newsfeed content to favor accounts that the user follows and engages with the most. Those accounts that the user engages with and looks at the most will show up at the top and all of their most recent content, even ones that were missed 3 days ago, will be shown over all the other pages. 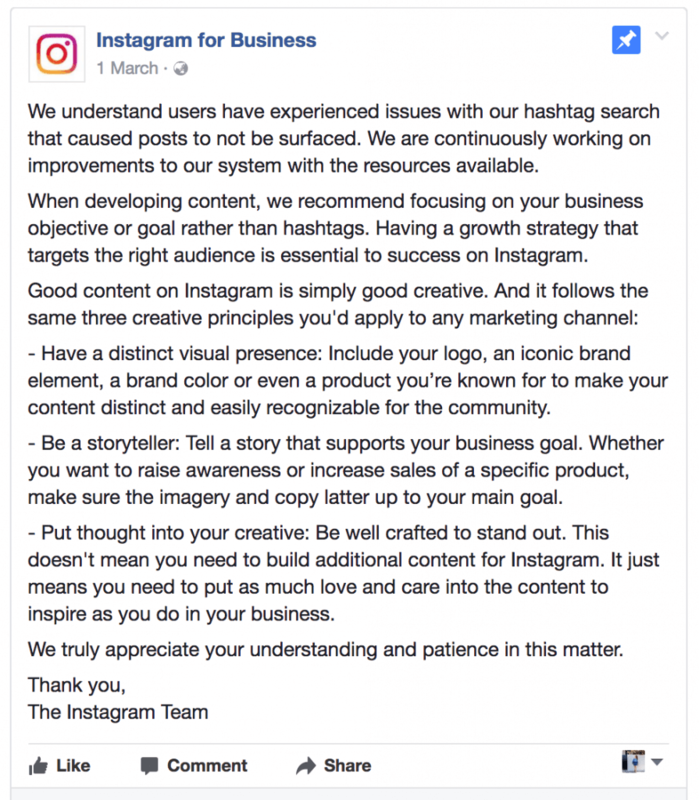 And since then, Instagram has been tweaking and perfecting the algorithm to do just that all for more personalized and optimal social media experience and this is the same for hashtags. That being said the actual reason why your content isn’t being seen could be that your content is either not being engaged with, which would mean you have an engagement issue that can be traced back to bad content or the hashtags used are not relevant enough to what you’re posting. Remember, part of providing an optimal social media experience is relevancy. No one wants to look at #food and then see a post for dryers in there. But even so, if you were to do all of this right you may still see a drop in engagement and it could be because of Instagram’s “Hashtag glitch” they admitted to in a post back in February. Some say it’s their way to punish accounts that do not follow they’re terms of service, It also could be a way to flush out spammy accounts that use the same tags over and over again or it could be like a lot of people suspect, a way to push businesses to use paid ads. Is the Instagram Shadowban a reality? The Shadow ban is definitely real. What is not real involves the reason why the shadow ban exists and how it impacts your social media. Instagram did not devise the shadow ban to hurt accounts or to intentionally hide profile content in hashtags. Rather, their anti-spam policy collided with poor foresight to create a hole known as the shadowban. Using the same hashtag multiple times, even if it is your brand’s hashtag (that’s where that lack of foresight comes in) results in a shadowbox on that post. heck how your current shadow banning is going – check out the couple websites that are tools to help you do so. I own a digital marketing agency, Road Warrior Creative, which specializes in food brands and social good organizations. Our food clients regularly ask for advice on how they can accelerate Instagram growth by taking minimal actions and investing the least amount of time, and we receive frequent inquiries regarding a number of third-party platforms that will take action on Instagram on your behalf – either commenting, liking, or following/unfollowing. While we strongly advise against using these services because they are against Instagram Terms of Service, clients often wonder if they are worth the risk, so we decided to give one a try on a test Instagram account. For 30 days, we had the test Instagram account connected with a service that would like, comment, follow/unfollow on the account’s behalf. The app seemed intuitive – you could select specific hashtags to target as well as followers of users – that seemed to be an attempt at only targeting the right or relevant users. We started cautiously and didn’t enable commenting, just liking and follow/unfollow. For about a week this seemed to work, and the test account gained followers at a clip of about 5-10 per day, with a post about 1x per day. On day 6, the app notified us that it had lost authentication to the Instagram account. We tried numerous times to reconnect, which required approval via a push notification in the Instagram app on a mobile device but never could, and then the mobile device was then unable to post to Instagram for approximately 2-3 weeks – even when the IG app was deleted and reinstalled, password reset, etc. Posts would hang up on the upload and never post. We believe that Instagram may have thought the device to be hacked or compromised and thus was blocking all posting and connection attempts. Posts could be made to the test account via a separate mobile device or Buffer, however, we saw the same issue that others have reported with posts not showing up in hashtag feeds, etc. Bottomline: I believe that there is a shadowban of sorts when Instagram believes that an account may be compromised. There is no easy shortcut to Instagram growth and risking being unable to have your posts seen is not worth it for any brand. 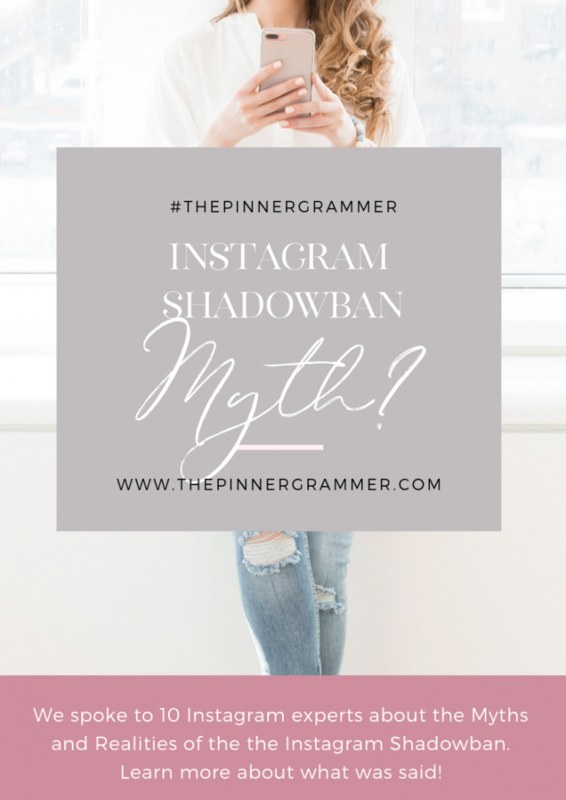 The Instagram Shadowban myth is… actually a reality! But it makes sense if you think about it from the perspective of the platform, understand what content performs best and that Instagram is trying to make sure we can all trust the network. I know the Shadowban is real because it happened to my company account. We didn’t do anything nefarious, but we did get busy for a while and put our content on autopilot, using the same, small set of hashtags for each and every post. The danger in this is that if the algorithm gets any hint that you’re not actually posting yourself, it throws up a huge red flag. Combined with the fact that we were posting very similar content every day at around the same time, one of the hashtags we were using got some questionable content tagged to it which other users must have reported. This had nothing to do with our content, but we weren’t actively keeping an eye on the conversations around the content we were posting, and it slipped through the cracks. mmers taking over nearly every other social network, it’s clear that Instagram is still working hard to make sure that even with tools to help schedule and plan posts, that users are posting authentic, unique content. The trick to avoiding the shadowban is to not worry so much about instant results (lots of likes or tons of new followers overnight) and focus instead on growing your audience organically over time through real conversations and unique content. Not to sound like a conspiracy type, but the shadow ban is real. What is the shadowban? Recently platforms like Instagram have been trying to class up their platforms in an attempt to make engagement on their sites more enjoyable and less abusive. This should be seen as a business move by Instagram and not a grand conspiracy. We know the ban is real because on February 28th of last year they warned against overusing hashtags. So what’s included in the ban? The Instagram ban is trying to minimize the reach of more than just abusers it’s also going after what it regards as spam-like behavior. This is where you might be affected. Instagram considers the hashtag game, that is using all the hashtags you can, or using the top hashtags as a form of spam, which really sticks right in the craw of many Instagram marketing strategies. They are more interested in engagement geared toward a specific audience. They maintain that good creative content will by virtue stick out and hashtagging is a form of cheating. The reason it’s called a “shadow ban” is that it only hinders your reach it doesn’t kick you off the platform. Other things to watch out for are using banned or broken hashtags on your posts. The best way to find out if you’re a victim of the shadowban is by searching the hashtags with a different/personal account and seeing if you can find your posts. If you suspect that you may have been shadow banned, report a problem to Instagram and hope that they get back to you. How do I check if I have been Shadowbanned? The instagram shadowban is NOT a myth. It’s a provable reality. How? Well, its easy and there is actually a tool as well. But first let me tell you how it works (the test). You post, and include a hashtag. If another person uses the search person for that hashtag and doesn’t see your post at all (use less popular hashtags to check easily), it means you are shadowbanned! When will my shadowban be lifted? Well – this we cannot answer for you! There are many ways you can apparently try to remove the shadowban with varying levels of success. This could take anything from 3 days to weeks or months. How can I avoid being Shadowbanned? Luckily there are ways to prevent this from happening. First, make sure you’re not using any software that violates Instagram’s terms of service. Next, don’t abuse Instagram’s daily and hourly limits which generally is no more than 150 likes, 60 comments, and 60 follows/unfollows per hour. Also, don’t use broken or abused tags meaning stay away from hashtags that have been riddled with inappropriate or spam content. And lastly, be careful not to do anything that will get your reported too much. If Instagram sees your being a nuisance they’ll take action which most likely will be in the form of either disabling your account or basically making you invisible. So in summary make sure you stick to the rules and here are some of them! Don’t use the same hashtags again and again – grab yourself about 50-60 well researched ones that you can rotate through. Using what we have learnt from online conversations, and the conversation from the professionals above, here is a list of some of the ways to lift the shadow ban. Disconnect any 3rd party apps, especially bots! Remove the hashtags from all your recent images, repetitive hashtags or banned hashtags. And finally try switching from a personal to a business account or from business to personal to see if you can change the way the algorithm perceives you. this was so helpful thank you so much!!!! Thanks Alyssa! So glad you found it helpful! Wow! This was such a deep-dive into shadow banning! Knock on wood… it hasn’t happened to me yet but it would be really terrible if it ever does. I like that you have actionable steps to help prevent and fix it! Thanks! Thanks Rebecca! Glad you liked it! Thanks a lot for collecting the different arguments and ways to deal with the possible “shadow ban.” I wasn’t even aware that we shouldn’t use the same hashtags over and over again. Thanks for the comment Nina 🙂 And indeed! Rather than just me saying its a thing, better to do some research right!? Such a helpful post! People are always talking about this, but no one ever investigates. Thank you!